The perfect palate cleanser to serve with Epoisses cheese. Place the olive oil in a large bowl with the lemon juice, orange zest and juice, honey, wholegrain mustard and a good grind of cracked black pepper. Whisk until combined then set aside. Place a small frying pan over a medium heat and toast the hazelnuts until golden brown. 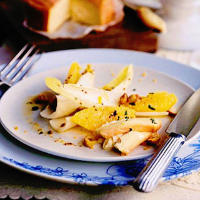 Toss the chicory leaves in the dressing with the orange segments, and the toasted hazelnuts. Scatter with the chopped parsley and serve with Epoisses cheese. This salad would be lovely with blood oranges and walnuts to match a blue-veined cheese.